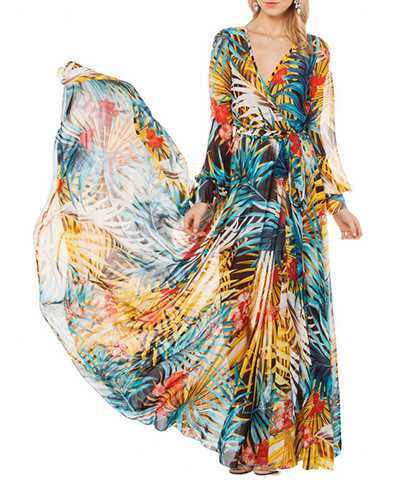 Length N/A 54" 54.5" 55.5" 56"
Breathtaking colors and chiffon, it’s a semi sheer wrap dress creating imagery that instantly transports you to the beach. It’s a feel good ankle length dress with lots of flowery movement. Tie wrap at the waist for the swanky lean look. Two main color options blue or green give you a choice that will blend with your skin colors. It is a match for everyone. Whether you’re at the beach or not, who cares you can just go along with the flow and it will meet your every objective.